You will probably also want to know that Exide is in the business of making Yuasa batteries as well. Briefly, 110 years ago Shichizaemon Yuasa established a manufacturing business. 6 years later, in 1915, Yuasa began building batteries. 50 years later, or 54 years ago, Yuasa USA was established. 40 years ago, Yuasa began making motorcycle batteries in a joint venture with General Battery Corporation (GBC). 32 years ago, Exide bought GBC. 4 years later, in 1991, Yuasu Japan bought Exide's industrial battery division, forming Yuasa-Exide, Inc, which was later renamed to Yuasa Inc. 9 years later, or 19 years ago, management bought out Yuasa Inc to form Enersys. So, like Hollywood movie stars, they've all slept with each other at one point or another. But I challenge you to find any GS Yuasa automotive battery today that is manufactured by Exide. Nice, what else is there that I should know? I'm not saying which batteries are better than others. What I can say is that the emergency batteries at our nuclear plant are Exide batteries. They are 2.2 volts batteries each is the size of a microwave - we have a lot of them. They last probably 20 years. Exide makes a pretty good battery, but like I said, you usually get what you pay for. Most companies make a economy version of their products with less stringent requirements so even the best names in the business sometimes makes cheapo products. "They are 2.2 volts batteries each is the size of a microwave"
Back in my old Ma Bell day we had the same kind of set up for the 48 Volt system. But they were huge, probably 2 x 3 feet "square" by three feet or more tall. Of course everything was early 1900's technology, in the PBX world at least. I see this a lot on the battery threads, everybody wants to know what battery is good, gooder, better or bestest but what always seems to be missing from the coversation is battery chargers. If maximum service life is the goal, and it should be considering the cost of replacement, then a good external battery charger is the way to go. It will pay for itself quickly. I got 9 years from Walmart batteries by using a tender. plugged in every night or when you knew the truck would sit for awhile? I plug my NOCO smart tender in every night. Just to clarify, every night year around? Or cold weather? i have a NOCO tender I use in the winter but it only hooks to one battery. Figured they would both get charged sooner or later. But I say the attached link for the 2 port tender and it looks interesting. Yes, when I pull in to the driveway I plug the tender in regardless of the weather. If you go to their website and you read up on how it works and you watch your voltmeter if you have one in the cab you could actually see the battery tender bringing the batteries back to life. Initially, after installation it, I would see voltage in the 13s to 14 V range, then High 14s and now the battery sit at about 12.8 to 12.9 after the tenders been plugged in for a little bit. Every time you plug the tender in it assesses the batteries and what they need if anything and applies the appropriate voltage. It applies 12V /4 amps to each battery and assesses them individually. All battery tenders are not created equal. 13.32 is the ideal charging voltage for "12" volt batteries. 2.22 volts per cell x 6 cells in each battery. I've seen some cheap tenders that have boiled lead acid batteries dry over time because of too high a voltage control - wouldn't ever shut off at a reasonable voltage. I'm not saying anything against tenders, I use them, just don't blindly think they are putting out the correct voltage - check them. There are tolerances above what I mentioned, 13.32 is the "theoretical ideal" voltage. Read the voltage while connected to the battery and when fully charged. As far as the voltage reading goes, the multimeter could be reading incorrectly if it isn't calibrated too. Nevermind, just hook a tender up lol. Well, someone also has to consider the stages and values of those stages for charging and maintaining a battery as well. You are correct. I am just stating the 'ideal' float voltage for battery tenders. I didn't make that clear in my previous post. Thank you for the info check Sous. Typical battery charger voltages are set much higher because they are meant to charge a battery and not maintain it. The higher voltages charge the battery quicker - at levels within reason. They are designed to be removed after charging the battery and that's where tenders take over. The tenders I use charge at 1/2 amp maximum and the voltage output is adjustable - they are homemade from emergency lights. 13.32 is the ideal charging voltage for "12" volt batteries. 2.22 volts per cell x 6 cells in each battery. I've seen some cheap tenders that have boiled lead acid batteries dry over time because of too high a voltage control - wouldn't ever shut off at a reasonable voltage. Well let's define our terms here. 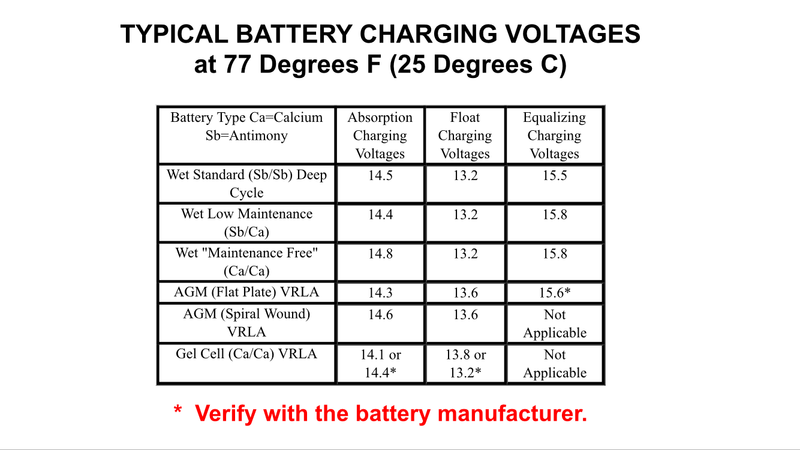 That's the ideal float charge voltage for standard lead-acid and maintenance free batteries at 77° F, just so everybody is clear on that. I know that's what you meant, but. As the temperature goes down though, even the correct float voltage changes and a correction factor is applied. This could be important to consider when storing a battery in an unheated garage, a well discharged battery will freeze. 13.2 is of course not anywhere close to a charging voltage, at any temperature, in case anyone was wondering. 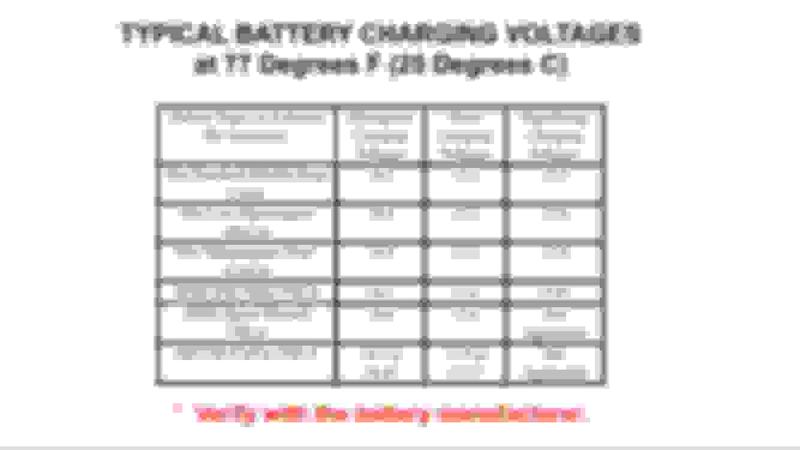 Modern battery chemistry too, is different than the standard batteries of yore, and have different charging voltages especially once an AGM type enters the picture. A few tenths of a volt is a big deal. It is important to use the correct charger paired to the type of battery being used, and in any case you're right, those cheap unregulated $5 wall wart jobs sound like a great way to start a fire or zap some expen$ive vehicle gee-gaw when it fails! This is what I used to use, but didn't like the 110 volts under the hood. This is the tender I am using now. I noticed at Walmart this weekend they have Maxx batteries, 3 year free replacement plus two year prorate, group 65, 850 CCA. These will be my next set at $93 each. I currently have the same batteries, lasted four years now, except mine are only 700 CCA. Never an issue.